Taking a dig at the Opposition, Defence Minister Nirmala Sitharaman said that when the Central Bureau of Investigation does its job, the opposition parties call it a political vendetta and when it doesn't, they call it a caged parrot. 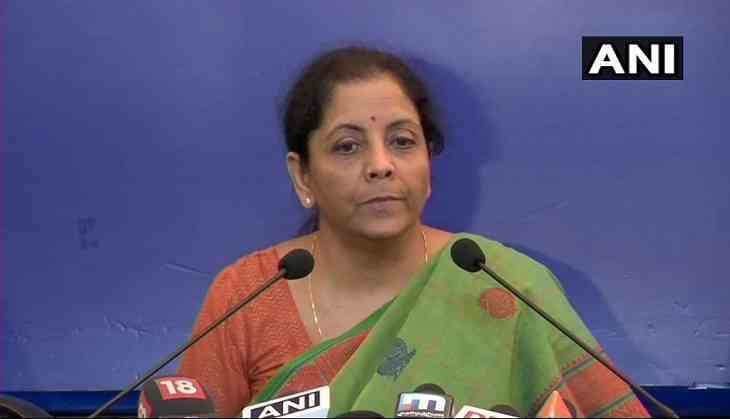 Addressing a press conference here on the intervening night of Sunday and Monday, the Defence Minister said, "The CBI has got to do its job or not? When CBI does its job, the opposition parties call it a political vendetta, when it doesn't, they call it a caged parrot. Let them make up their (Opposition) minds." Targeting the West Bengal Chief Minister Mamata Banerjee for hampering the CBI investigation in chit fund scam involving state police commissioner Rajiv Kumar, Sitharaman stated that the Opposition needs to make up its mind about CBI and its operations. A full-blown face-off between West Bengal's Mamata Banerjee government and the Centre erupted as a CBI team moved to arrest Kumar on Sunday, which in turn were unceremoniously denied entry to Kolkata Police chief's residence and then detained.Escalating her confrontation with the Centre, Banerjee started a sit-in on Sunday night to protest, in what her Trinamool Congress party called a "coup" by the Modi government. The Defence Minister further stated that the BJP will move the Supreme Court against West Bengal government for denying permission to conduct rally by Yogi Adityanath. "The TMC is worried about the growing popularity of the BJP in West Bengal and this state is now turning out to be a difficult place for BJP workers in the state," she added. Extending support to Mamata, her party workers also staged a 'rail roko protest' in Rishra and Asansol over the ongoing issue. The TMC workers have also burnt an effigy of Prime Minister Narendra Modi in Asansol. CBI interim director M Nageshwar Rao has said that the CBI will approach the Supreme Court on Monday accusing the Bengal government of impeding the investigation of a court-ordered probe into the chit fund scams. The CBI officials are also planning to meet state Governor Keshari Nath Tripathi, however, the investigative agency has sought some time from him to discuss the matter. While speaking to ANI, Rao alleged that the state Police Commissioner had hampered evidence in the chit fund scam and the CBI has evidence to prove the same. All the five CBI officers who were detained by police at Shakespeare Sarani police station in Kolkata have been released.Several Opposition leaders including Samajwadi Party (SP) president Akhilesh Yadav, National Conference leader and former Jammu and Kashmir chief minister Omar Abdullah, Dravida Munnetra Kazhagan president MK Stalin came together to support Mamata Banerjee. Congress president Rahul Gandhi also extend his support to TMC supremo stating that what is happening in Bengal is a part of the unrelenting attack on India's institutions by Prime Minister Narendra Modi and the BJP. "I spoke with Mamata Di tonight and told her we stand shoulder to shoulder with her. The happenings in Bengal are a part of the unrelenting attack on India's institutions by Mr Modi & the BJP. The entire opposition will stand together & defeat these fascist forces." the Congress chief wrote on his Twitter handle. Rajeev Kumar, a 1989-batch IPS officer of West Bengal cadre was heading a SIT on the Saradha and Rose Valley scams. The CBI wanted the top officer to hand over the seizure list made during his probe, sources said.Reportedly, the top cop was to be questioned regarding missing documents and files but he is not responding to notices to appear before the agency.Rajeev Kumar, according to media reports, became apprehensive of his arrest after Bengali film producer Shrikant Mohita was taken into custody.